Donald C. Kelly is the founder of The Sales Evangelist Sales Training Organization, where he helps new and struggling sellers find more prospects, build strong value, and close more deals. His secret is in keeping sales simple and mastering the fundamentals. That's the secret. As The Chief Sales Evangelist for TSE, He oversee business development strategies for small to mid-size organization. He also conduct workshops, keynote presentations, design sales processes, offer sales team training and coach sales individuals and executives. If you are new and frustated, want to make improve your sales and close more deals, Listen to this episode. 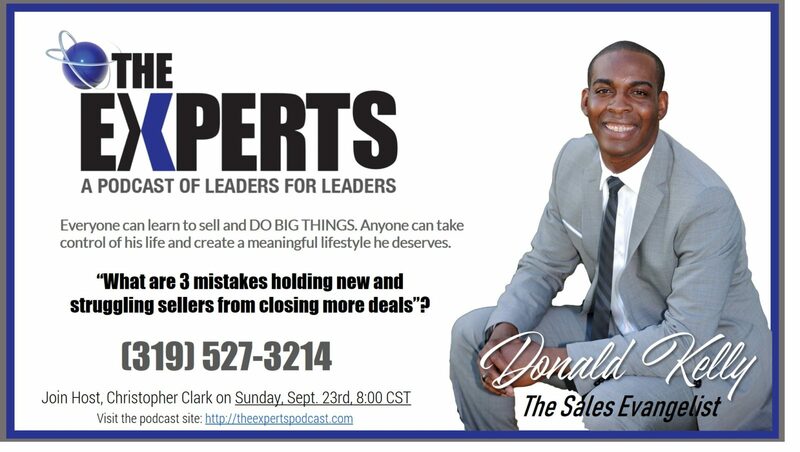 In this conversation, Donald shares 3 mistakes new sellers do. Donald is a big believer in connections and started a sales career at a very early age due to watching the success of his father, and the hustle of his mother. A Jamaica native, Donald spoke of living with a hunger and a burning thirst for success, all while understanding what it feels like to not have the basic necessities of life. He had a date with destiny when it came to sales and sales training, growing up seeing the blueprint of his mother's career, and embracing the relentless drive of his mother. Donald grew up believing if you want something, make it happen, and that he did. 2013 was a big year for Donald and his Sales Evangelist Podcast and training. Podcast after podcast, connection after connection, he pulled strength from his Mothers wisdom and continued to pursue his desire to truly impact people with his sales skills and talents. His podcast is building an empire to not only be successful in sales but in life. Donald is passionate about giving back to his home country by sponsoring dental charities for children and has a mission of helping others to be successful in life. The excitement comes from influencing others and leaving a legacy through his works. Anyone can sell with 3 things, desire, hustle factor, and training. The biggest of these is the hustle. The hustle factor means you are willing to make it happen no matter what the obstacles. This can be in the form of personal phone calls, text messages, birthday cards, gifts; basically anything that can grab a persons attention and position yourself to be in their circle of influence. Those who are successful are usually looking to promote something, be it a book, training, speaking engagement, or a charity of some type. Figure out how you can best support their cause, and the connection will be established. In the book, Think and Grow Rich, the burning ship theory, where two nations at war, the captain made landfall and ordered to burn the ships. This caused the men to either fight and conquer, or die on the beach. This is a perfect example of eliminating excuses and obstacles in your path of success. Host, Brad Smith reminded us that the way you do one thing is the way you will do everything. It's a matter of character. It's a self-image issue. If you are stuck in anything, it comes down to one of three things, strategy, skillset, or self-image. Most often, it's self-image. TD Jakes says, "I can teach you how to cook, but I can't teach you to be hungry". That's where you see the hustle when you are hungry. There are 3 major things that keep sellers from closing the sale. 1. One of the biggest mistakes made by people in sales is establishing a funnel, but not putting enough people into the funnel. Getting leads into the funnel has to be a priority each and every day. Any lead generation should be touched within the first 5 minutes, and definitely not longer than 24 hours. We live in an instant definitely where everything has to move quickly. The longer the lead is open, the more difficult the sale will be to pursue. Fill your funnel with fresh leads daily, and always push for 3x more prospects than average for your industry. You have to dedicate time to your calendar. 2. The value. Not building strong value before you get to the ask. You want to paint a picture by telling stories to create the vision of where you are at, and where you want to be. This is about asking the right questions at the right time. You have to be comfortable asking questions that are going to challenge the prospects way of thinking. You have to help them to see what they cant see right now. In the book, 3 value conversations, the unconsidered need are things the buyer may not be aware of that you can solve. The sellers who can identify this, have a better opportunity to close. 3. Sellers who are afraid to ask for more. They are afraid of doing something that is uncomfortable. If you have built the value this will not be difficult. You have to get outside of yourself and be willing to take a risk. Invite people to do what you want them to do. Chris Clark refers to it as, "15 seconds of bravery" and helps us understand how letting go of fear can get you to the next level. Success isnt shine and polish, its grit and grind. That is the moment when your success if defined.